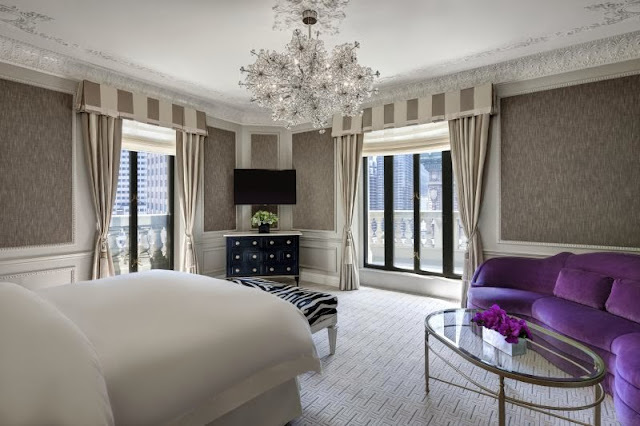 New York, NY – The St. Regis New York is proud to announce the hotel is concluding an extensive renovation to culminate in a striking reveal this month. With renovated and redesigned guestrooms, suites and public spaces and the debut of the new King Cole Bar & Salon under renowned New York chef and restaurateur, John DeLucie, The St. Regis New York will unveil a bold new era of glamour at Manhattan’s best address. The renovation will reflect the hotel’s enduring legacy while infusing the timeless allure which has defined the Fifth Avenue icon since its founding by John Jacob Astor IV over a century ago. The multi-million dollar, comprehensive renovation at The St. Regis New York culminated this November 2013, with redesigned guest rooms, suites, hallways and public spaces. HDC, the renowned interior design firm that transformed The St. Regis Florence, has created an aesthetic based on a “timeless is modern” philosophy, embracing the design legacy of the hotel while infusing contemporary style. This fresh and sophisticated approach will marry original design elements, such as the crystal Waterford chandeliers and elegant crown moldings, with beautiful, large-format photographic artwork, vibrant-hued fabrics and stunning beveled mirrors. The treasured King Cole Bar, Manhattan’s most storied meeting place, will see expansion into the King Cole Bar & Salon, where an extensive lounge will feature a dramatic open fireplace. Uptown sophistication meets downtown chic in this reimagined space where The St. Regis New York will also debut a new culinary partnership with renowned New York chef and restaurateur, John DeLucie. With the debut of John DeLucie at The King Cole Bar & Salon, the hotel will offer an unrivaled dining experience that is quintessentially Manhattan. The new restaurant will feature modern American cuisine with an international twist, reflecting the rich cultural mix that is New York City. The menu will offer a tailored selection of small plates including new creations, DeLucie’s celebrated specialties and reimagined classics from the hotel’s early days. Infusing contemporary glamour into the landmark hotel’s rich culinary heritage, John DeLucie will create a dynamic epicurean experience for New York’s social elite and a new generation of luxury travelers. The Fifth Avenue landmark will reveal a new vision for its public spaces as well. In the iconic lobby of The St. Regis New York, the renovation will reincorporate lost architectural elements, including opening up oval windows above the front desk which were part of the original design of the hotel, while simultaneously infusing fresh touches through updated furnishings and amenities. Following the 2013 renovation, the beloved classic elements of the lobby and salon spaces will shine brighter in a contemporary context. The guestroom floors will feature chic, black-lacquer painted doors, textured fabric walls and five distinct color palettes in the entryway on each floor. Guestrooms will be updated to include marble tiled entryways, rich color schemes with bold accent colors, sumptuous fabrics and luxe leather details, custom furnishings and state of the art technologies. An extensive art program, with emphasis on New York City photography by Janet Arsdale and Hampton Hall, will be integrated into every guestroom and suite. Additionally, every bathroom in the entire hotel will be renovated, refurbished, and updated to create a spa-like atmosphere paired with the latest technology. The St. Regis’ master suites will undergo remarkable redesign and extensive renovation complementing the reimagined guestrooms. The dramatic Imperial Suite will feature European Chinoiserie and East Asian furnishings set against alluring red tones with crystal and gold leaf accents. Mixed stylistic influences and a reinvented open floor plan will lend a residential flow to the space, while plush new window seats will offer both stunning views of Manhattan to Central Park, and serve as cozy havens for retreat. The Royal Suite will embody the perfect mix of European style and American spirit. The suite will feature a rich color palette, gilded moldings, exotic prints and an eclectic art collection. The Presidential Suite has been reimagined as a sumptuous collector’s suite where sophisticated global luxury travelers will surround themselves with the art and treasures of their travels. Furniture styles range from contemporary to classic and blend seamlessly with chic accents, making it the ideal locale for both stylish entertaining and relaxation. The renovation will bring new luster to the hotel’s exclusive collection of designer suites: Bentley, Tiffany and Dior Suites while maintaining their unique and beloved bespoke décor. The St. Regis brand’s ongoing legacy comes to life through continued traditions including jazz, signature Bloody Mary cocktails and Maxfield Parrish’s “Old King Cole” mural casting its watchful eye as New York society meets, entertains and celebrates in the beloved space. Throughout the renovation, the hotel has remained committed not only to the preservation of the St. Regis’ legacy, but to an uncompromising level of bespoke and anticipatory service, delivered flawlessly by the brand’s signature St. Regis Butlers, who have traded in their silver trays for smartphones and are as adept formatting spreadsheets as they are shining shoes. 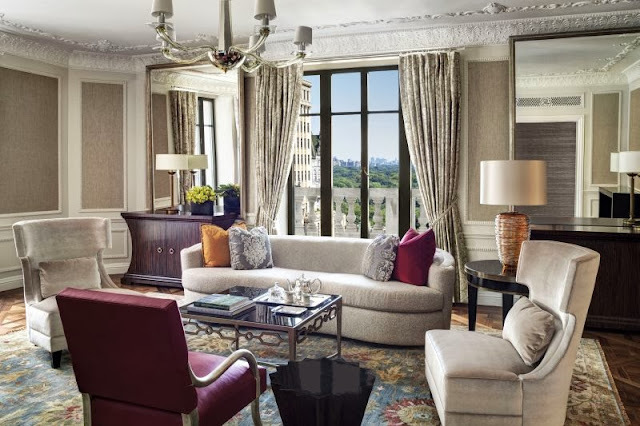 As Starwood continues to invest in the creation, renovation and restoration of its global luxury portfolio, it remains essential to celebrate the St. Regis brand’s heritage and its flagship on Fifth Avenue. Engaging a new generation of luxury travelers and tastemakers, the St. Regis brand will debut a new era of glamour this fall at The St. Regis New York: the foundation for all St. Regis properties around the world.